Last seen in 2003, the EA sports franchise Tiger Woods PGA Tour 2005 ( ) puts you in control of the enormously popular golf pro and other legendary PGA pro golfers as you take to the links, proving your mettle against some of the toughest opponents in the toughest courses in the world. Playing as Tiger, Vijay Singh or a slew of other professionals may not be your cup of tea, however - using built-in tools, you can create a golfer in your own likeness (or in the likeness of anyone else you choose, for that matter). In addition to outfitting your golfer in custom clothes, sunglasses and other accessories, you can also adjust the body type, complexion and facial structure right down to manipulating brow height, chin length and fullness, and even the type of nose. It’s starting just how much you can do. As a golfer who’s just starting out on the PGA circuit, you start out with pretty limited funds and capabilities. You can improve yourself by winning bets (chip and putt sessions, for example) or by winning one-on-one pick-up games against fictitous, computer-controlled players. You can roll the money you win in these contests over into lessons or physical improvements to your game - improving your tee shots, for example, or gaining more accuracy on the green. If you do particularly well, you’ll catch the eyes of equipment manufacturers, who, just like in the real world will offer you money in return for endorsing or using their products. If you get good enough, it’s conceivable that you’ll even pass Tiger Woods someday on the money list. You can play legendary courses like Pebble Beach, St. Andrews and TCP at Sawgrass, along with new courses for this version like Sherwood Country Club, Fancourt Golf Club Estate and others - almost a dozen in all. 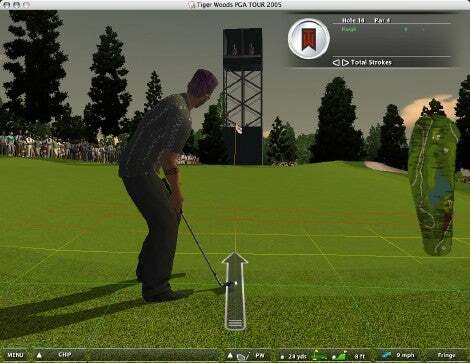 If you’re more accustomed to the two or three-click swings types of games like Links, you may find Tiger Woods “TrueSwing” method a little offputting at first - you simply click the mouse and swing back and forth to emulate your on-screen persona. How smoothly, accurately and quickly you do this determines with what sort of speed and accuracy you hit the ball, and careful control of the mouse can generate hooks, slices and other effects. As great as 2003 looked, the 2005 edition is even better - environments look real, character animations are incredibly life-like and detailed, and fans in the gallery standing off to the side of the green even are more detailed than before. The animations that your character engages in when he or she hits a difficult putt get annoying fast - especially when they evolve from Tiger-like raised power fists to full-blown headstands - but they can be skipped by hitting the Escape key on the keyboard. Sound is top-notch as well: Just like on TV, your game is commentated upon by PGA experts, who will even give you a bit of indirect advice (this green lies a bit to the left, this shot looks straight, etc) that gets a bit irritating after a while but is nonetheless helpful. It’s a nice morale boost to hear the fans cheering when you whack your ball 325 yards or more on a long Par 5. “Tiger-proofing” is another benefit found in this new 2005 edition: It lets you rework the courses you play by tightening up the holes - expanding sand traps and water hazards, for example, shrinking the width of fairways, adding more varied terrain to greens. It’s quite challenging. Bear in mind that Tiger Woods PGA Tour 2005 is a pretty serious simulation - if you’re looking for something more arcade like, check out Garden Golf (below). And because of the advanced physics and graphics, you’ll need a 1.2GHz or faster G4 and a fairly fast graphics card, as well (ATI Radeon 9000 or Nvidia GeForce FX 5200 or better). You can play online, although you’ll be limited to Mac to Mac connectivity. GameRanger is supported, as well, so finding opponents online shouldn’t be overwhelmingly difficult.